Taurus traits will show up in their reliable, careful and steadfast nature. Stability is a a keyword for this astrological sign. 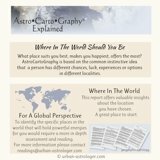 It is the second sign of the zodiac and the physical elements of life are very important here. Here is a quick visual guide to Taurus Traits. Much of your physical reality will be explored through touch. There is a very definite kinesthetic quality about Taureans. Exploration of your environment is experienced primarily through a sensory mode. You do not like to rush into things without planning. Generally practical and you do enjoy the material things in life. With Venus being the ruler of your sign, you have a great love of beauty and the finer things in life. Taureans are often considered the historians of the zodiac. You have a love for history. As the bull of the zodiac you will work steadily and can be the most productive of all the zodiac signs. A methodical process with this steadfast approach always ends in achievement. Your need to produce tangible results and this helps you to overcome any obstacle. Generally Taureans do not like upheaval. You like to plan and to follow the plan. You are best in any environment and any relationship where there is solid commitment and trust. You are loyal and trustworthy in your relationships. You apply this to all who enter your space.. The basic traits associated with your sign are stubbornness, patience, loyalty and emotional stability. The	glyph for Taurus represents the actual head of a bull surmounted by its horns. Taurus is the second sign of the zodiac.It is a member of the fixed quadruplicity, feminine and of the earth element. The Sun enters the sign of Taurus around 21 April and exits around 21 May. 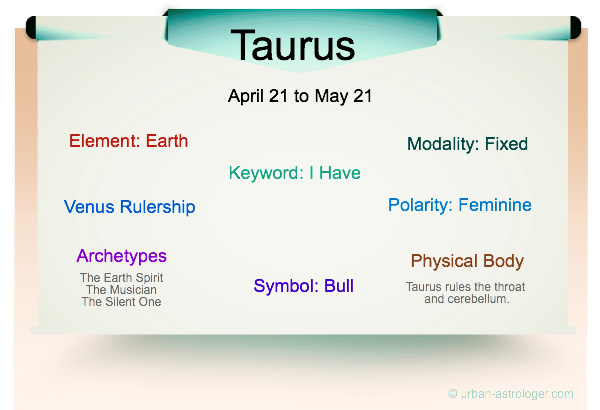 The qualities of Taurus are often associated with the qualities of spring. Symbolically the written symbol of Taurus reflects the circle of Spirit and the crescent of Soul joined together.